The dam was completed in 2004 and is designed to irrigate around 2,600 hectares. However, the command area development is hobbled by land acquisition issues. Water being released from Dhatarwadi-II dam on Monday. Water released by the state Irrigation Department from Dhatarvadi-II reservoir to meet the demands of the farmers ended up in the riverbed downstream as the canal network of the project has not been developed fully. Earlier this week, 14 million cubic feet (mcft) of water from Dhatarvadi-II reservoir was released to meet the irrigation needs of farmers. “While we are making all efforts to complete the digging of canal, as an interim arrangement, we are releasing water in the river. 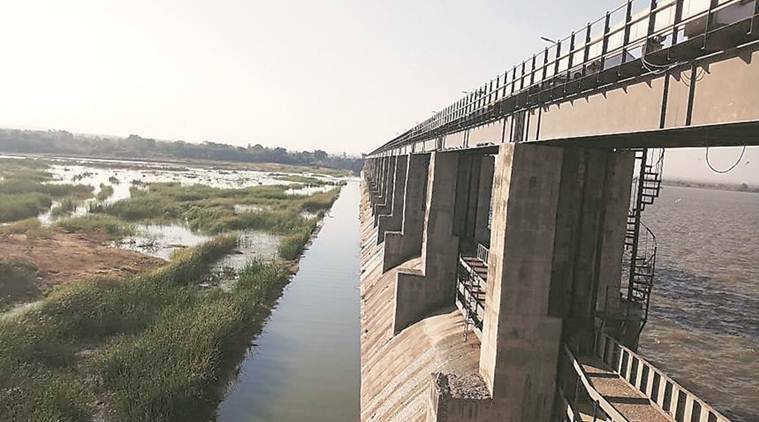 Since farmers will have to lift water from the river, we believe that farmers will use the water more judiciously,” Hemant Patel, executive engineer of Amreli division of Irrigation Department told The Indian Express on Wednesday. “While we are supplying irrigation water to farmers through right bank canal, the left bank canal is incomplete and therefore we are not discharging water into it. Since farmers are demanding water, we are supplying them indirectly by releasing it in river and farmers have agreed to irrigate their farms by lifting water from the river,” Patel further said. This is for the third time in the history of the project that water has been released in the river stretch downstream the dam for irrigation. Water was released in a similar manner in 2014 and 2017. Congress MLA from Rajula Amrish Der as well as Amreli MP Naran Kachhadiya had made representations to the Irrigation Department to release water from Dhatarwadi-II dam so that farmers in its command area could irrigate rabi crops. After the state government gave a green signal to release water from the reservoir, water was released on Sunday afternoon for the next 20 hours. “We had approval from the government to release 14 mcft water in the riverbed for irrigation. Accordingly, we opened one gate half-feet and released water for 20 hours, spanning Sunday and Monday. The water will help irrigate 210 hectares on the left bank of the river downstream the dam,” Patel said. The water will benefit farmers of downstream villages like Khakhbai, Vad, Bhachadar, Uchchaiya, Dharanes, Rampara-II among others. Officials said that farmers of the villages had paid Rs 75,000 to the Irrigation Department for water. The Congress MLA said he would take up the issue of an incomplete canal with the state government. “It is a serious matter. The government has not been able to complete the canal network despite two decades having lapsed. I will raise the issue at an appropriate forum and seek completion of canal network at the earliest,” Der said on Wednesday. Dhatarwadi-II dam, located near Rajula town, has a gross storage capacity of around 360 mcft and live storage capacity of 262 mcft. But due to very little rain in the later half of monsoon, there is shortage of irrigation water in Amreli. Irrigation officers said that on Wednesday the dam’s live storage stood around 50 mcft. The dam was completed in 2004 and is designed to irrigate around 2,600 hectares. However, the command area development is hobbled by land acquisition issues. While the main canal on the right bank with a designed total length of 9.2 km is almost complete, a 300-metre section is still incomplete. The left bank main canal, which has designed length of 8.85 km, is incomplete.